An operator of the poison oracle (benge), a boy identified as wiri dawiri Tupoi i.e. 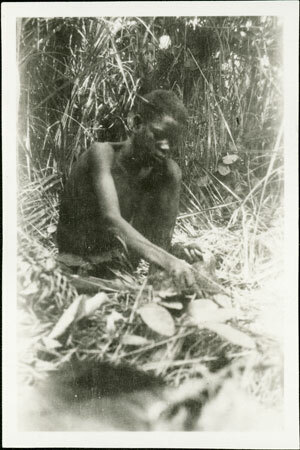 Tupoi's sister's son, sitting on the ground reaching down, possibly towards a vessel containing the poison mixture. Notes on card mount m/s pencil - "slight fading 5/88 EE"
Morton, Chris. "Consulting the Zande benge oracle" Southern Sudan Project (in development). 03 Jan. 2006. Pitt Rivers Museum. <http://southernsudan.prm.ox.ac.uk/details/1998.341.250.2/>.